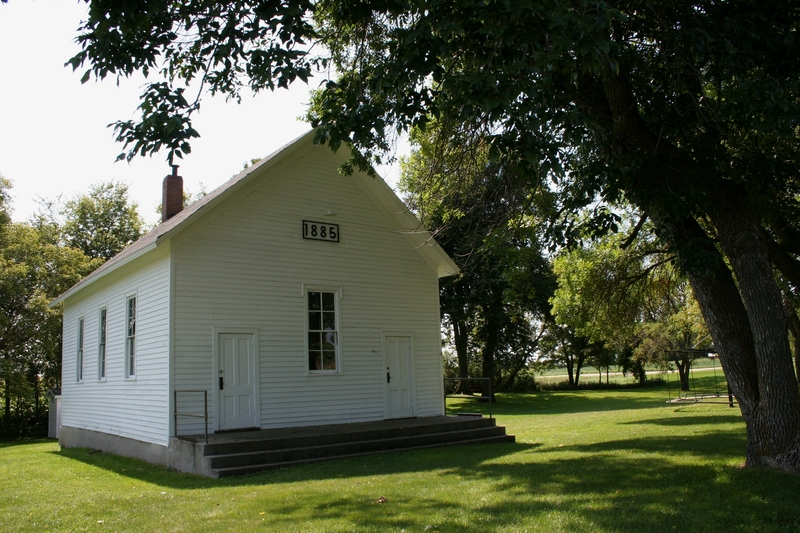 My mom went to a one room school house and they still hold reunions yearly–she has not been able to make it to one for a few years but it is a pretty incredible part of history to be able to say you were a part of one!!! Great photo shoot! I would expect those who attended these one-room schools share a bond stronger than students at a “regular” school. To hold yearly reunions is quite impressive. lived with us. I still love to read. At one time there were 17 students in the school and 12 of us were first cousins! Twelve of you were first cousins. Wow. What fun that must have been. And what sweet memories you have. I love to read, too, and I attribute that partially to teachers who, every day after lunch, read chapters from books like Tom Sawyer, Black Beauty, the Little House series, etc. We also said the Pledge of Allegiance every morning. 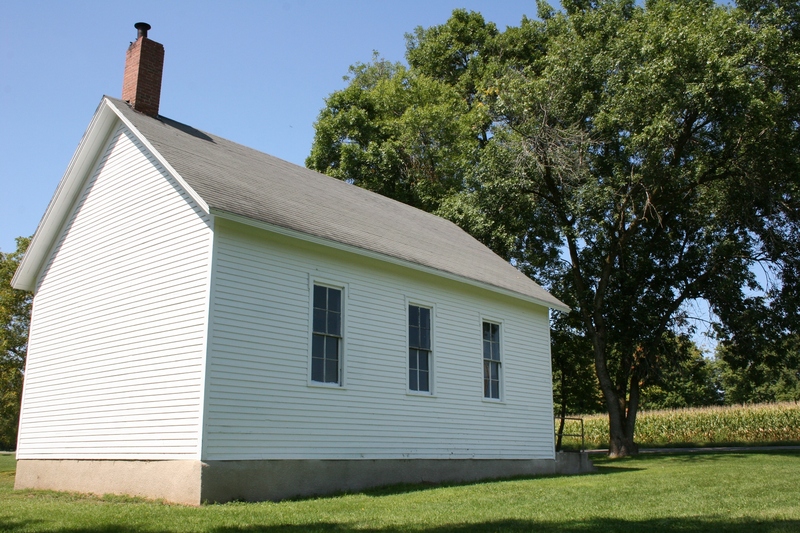 Love to see an old school house in working order – loving your captures – have to check out that book:) Thanks so much for sharing – Happy Monday! 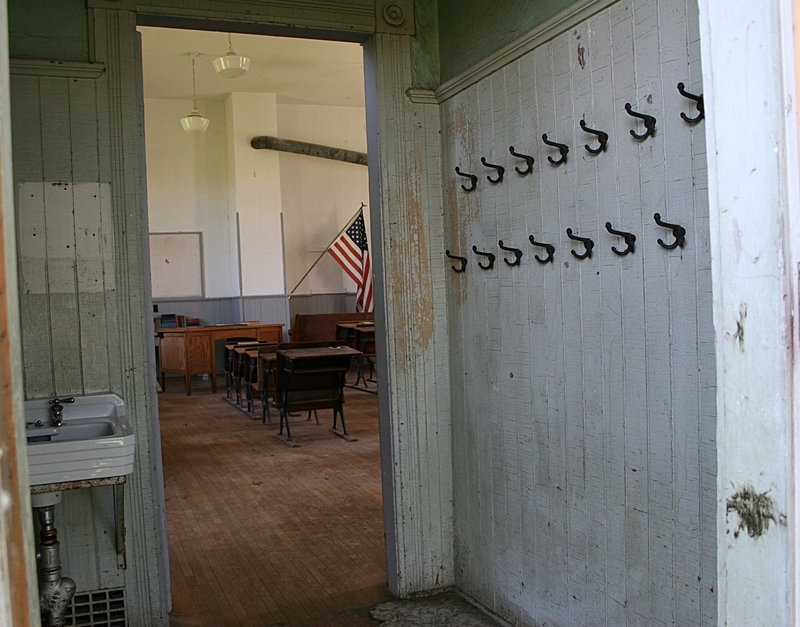 Old schoolhouses rank right up there with country churches. 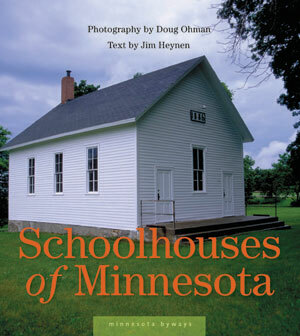 So glad to hear that the old schoolhouse was not torn down and is still being used. It seems quite common to reuse them as town halls. 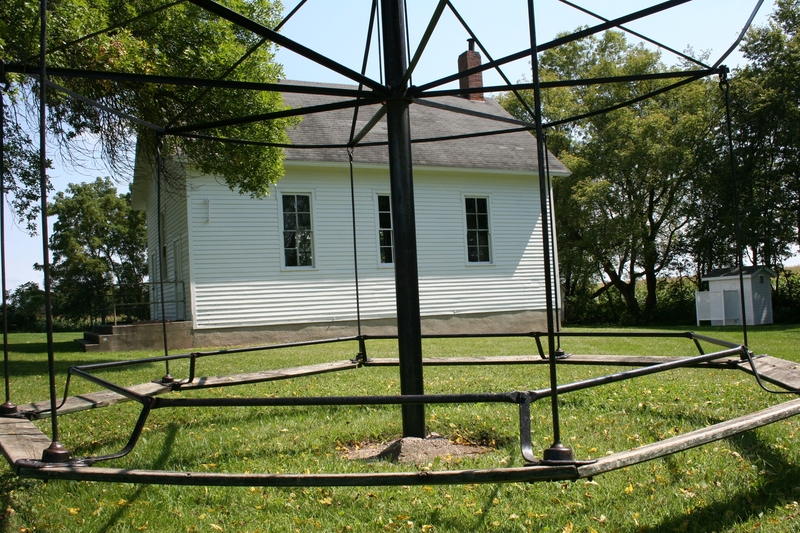 I am always delighted to see these old schoolhouses preserved. Locals obviously put a lot of work and care into preserving this one. I enjoyed this very much. I would love to visit this place. 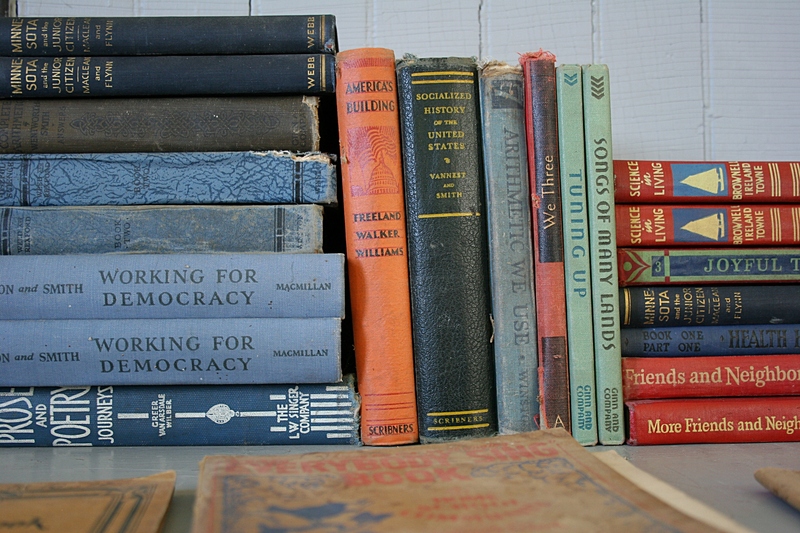 I have always been a fan of America’s pioneer days and way of life, including schooling. 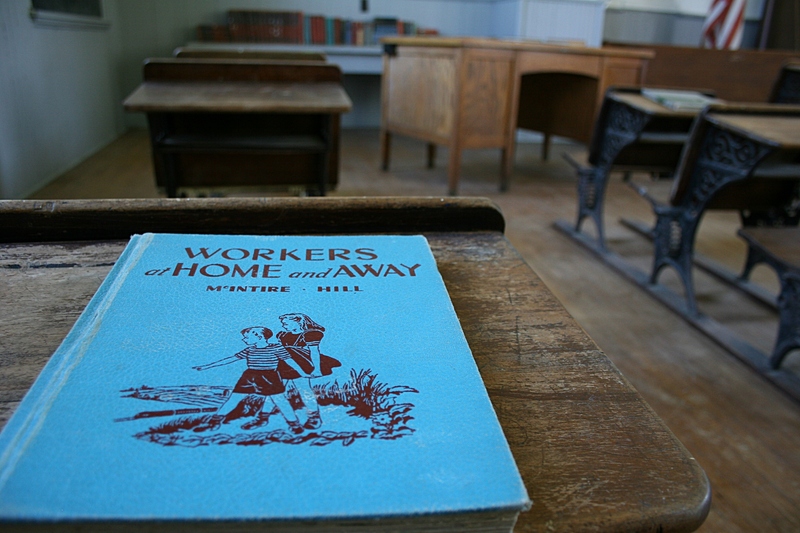 Some of me ancestors were one room school house teachers in the South. Thank you for sharing. It was just luck that we were able to get inside. 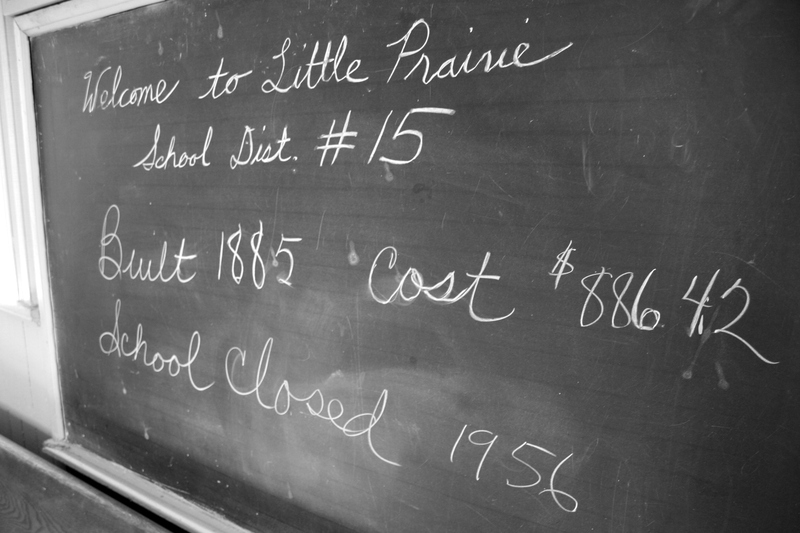 If you truly do want to see the school interior, I’d call Little Prairie church and I’m sure a time could be arranged to allow you access. Hi Audrey, I enjoyed your story and pictures here, I went to a one room school between Ellendale & Hope, Dist. 36 changed to Dist, 2108. Never got any pictures here but here’s a story I wrote on Facebook on one of my Sunday stories I write every week. Hope you enjoy. 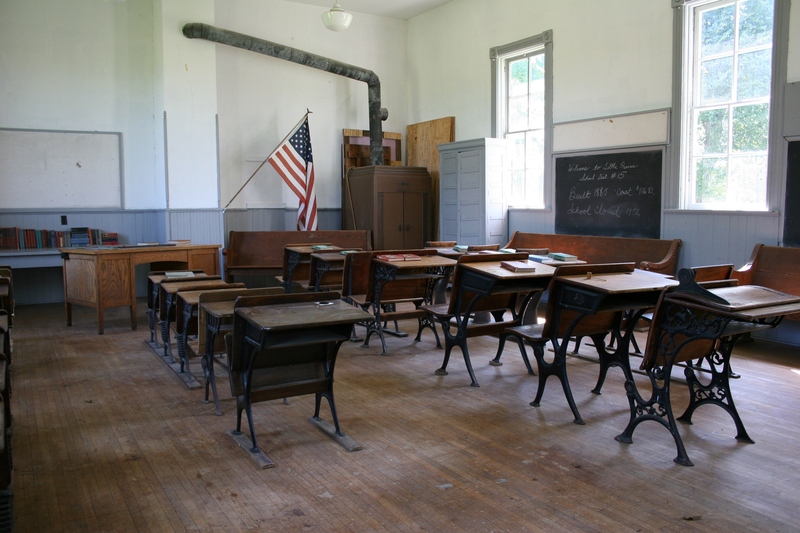 I was watching TPT last night and a gentleman was telling Don Shelby about his life back on the farm and 1 room school house and it brought back a flood of memories and end of innocence. I grew up on a 80 acre farm, didn’t have much for livestock, a few chickens. One year we raised a calf we named “Rosie”, which I took out of the barn every morning down to a small partial filled swamp full of grazing grass and back to the barn at night. when it came time to butcher and eat poor Rosie, we couldn’t. Rosie became a pet to all of us, I can’t remember what we did with the meat but I know we couldn’t eat poor Rosie. 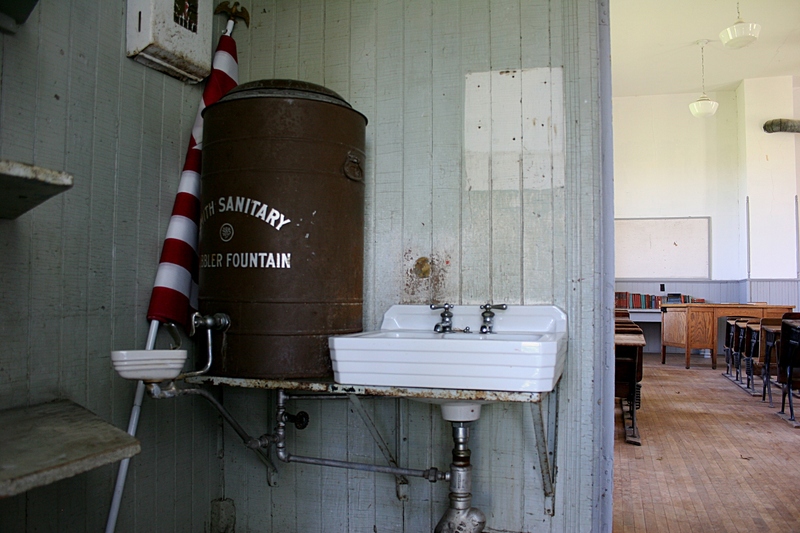 I went to a one room school house with a water fountain in the front entry we had to fill every morning from water two of us gathered in a tin pail where we walked up a long driveway next to the school. Was a little bit cold in the winter. The water got a little icy in the unheated entry. Inside the door was a little refrigerator we kept our sandwich’s we brought to school and the glass milk bottles somebody dropped off weekly. We had to shake the milk bottles real well because the cream would fill the top 1/3 of the bottles. Our 3 rows of desk was kept warm by a big old oil heater that was hot by the heater and cool towards the front of the classroom. I remember a big old portrait of George Washington in between the huge windows on the north wall, the blackboard with ABC’s on top covering the east front of the room. A table on the front left side was our classroom, two or three of us with the teacher learning our lessons. On the right side another table we would sit at during recess in the winter if it was too cold or we didn’t want to venture out we would read, listen to a little portable record player, ( I always like playing “How much is that doggie in the window”), reading a book or things like putting lincoln logs together on Lincoln’s birthday. Another time while causing somewhat of a rucus she put me in the same library to settle down, be quiet and think about it. I was suppose to face the back wall, (the first time out I guess). I turned around to see if she was looking……Mr. Larson, she boomed, I can see you and I’m watching you…… Another lesson well learned. I loved country school, I felt I learned a lot with just two of us in a class as we had her undivided attention. We started out with the Pledge of Allegiance, sang a patriotic song, had class, recess on an acre of land, more class, lunch hour, class, recess and more class. Things were simple, had a pole with chains with handles we could swing around, maybe 3 or 4 of us at a time. Played ball, never did hit the ball over the fence that had horses on the other side like the bigger kids could do. Had two outdoor toilets, a boys on the north, the girls on the south. 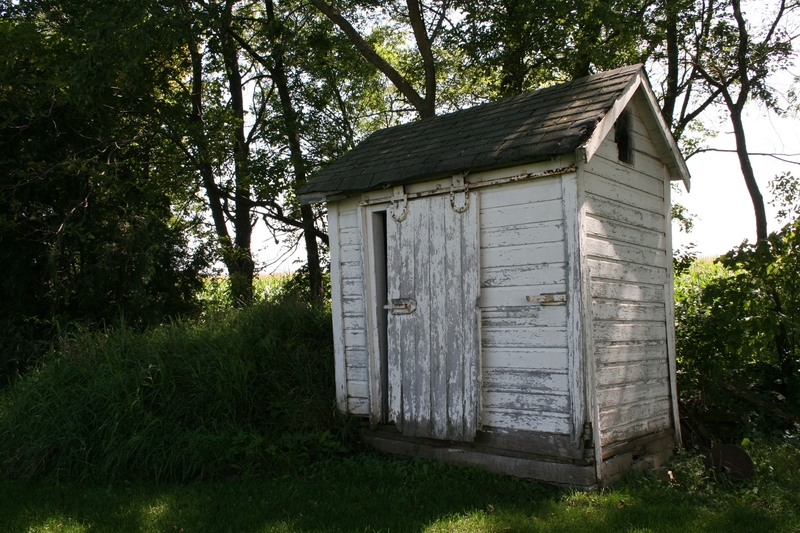 I can still smell the big oak tree towering over the boys toilet. We would play anti i over, girls on one side of the school, boys on the other, throw the ball over the roof and and run with the ball in the back of our bodies, to the other side and tag somebody until there was nobody left. Funny how we lived without a playground full of equipment, classrooms, indoor toilets, gyms, sports and all the electronic gadgets. I don’t think I’m worse for the wear. Our yearly program was usually Christmas time when we would put on a little skit in front of the blackboard while parents sat in the back of the room on fold up chairs. My biggest theatric line was “I’ll just act nonchalant”. Wow I was on my way to stardom, only there wasn’t an agent to see me. Mrs. Thompson with her infectious grin with her gold tooth gleaming brightly taught us respect and grace. She gave us a foundation to go headlong into the turbulent 60’s and the end of innocence. Oh BTW I walked up hill though wind, blizzards, and storms both ways through the years, when my folks didn’t pick me up or the school bus from Ellendale didn’t stop and pick me up as I was (by coincidence) walking about a quarter mile from school. Guess I did ride my old bike when the weather permitted. They were wonderful times and am grateful for the experience, I wish I had school pictures, but have good memories. Have a gentle day everyone. Milo, thanks for sharing your wonderful memories of attending a one-room country school. There is much to ponder in your words about a simpler time in life. Much. What wonderful memories you have. I especially like that Mrs. Thompson taught you “respect and grace.” That shows in the type of person you are. Im a college student in Northfield and for the past four years have been visiting a wonderful woman in her 90s who was a teacher in the Little Prairie School House for two years, I believe during WWII or the years right after. She likes to tell me how she always made sure the students learned about art history in addition to their normal classes. Im so glad the building is still standing and I can’t wait to share these photos with her. Is there anyone I can get in touch with to get a tour myself? Thank you! I would suggest calling the Little Prairie Church. The pastor happened to be at the church across the road when we stopped and he opened the schoolhouse. I’ve only seen this school from the outside. Thanks for those great pictures. My mother attended and her older sister and brother attended this school and grew up on a family farm relatively nearby. 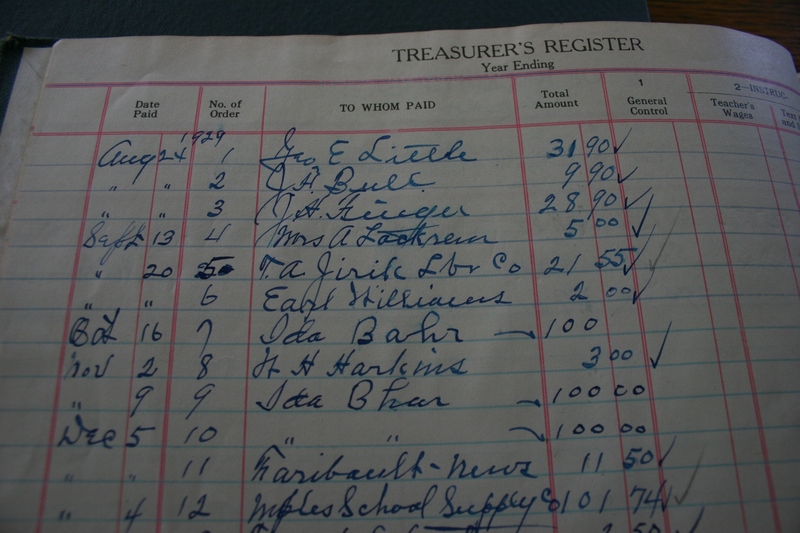 Mom attended from 1930 – 1937, completing the first 8 grades in 7 years. She tells the story of coming back after Christmas her 1st grade year and suddenly being in 2nd grade. 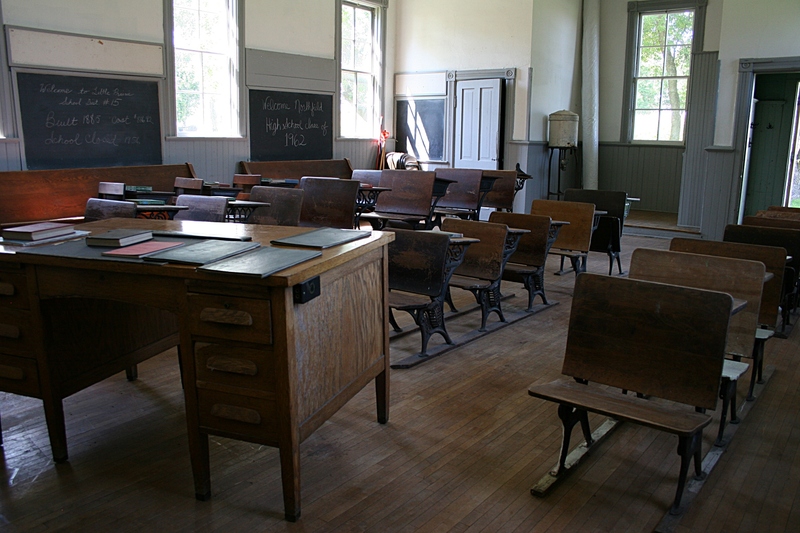 In one room school houses teachers ( and the older kids) could teach the students at the level in which they were ready. Her name was Audrey Swartwoudt and is now 92 and lives in Seattle, WA. 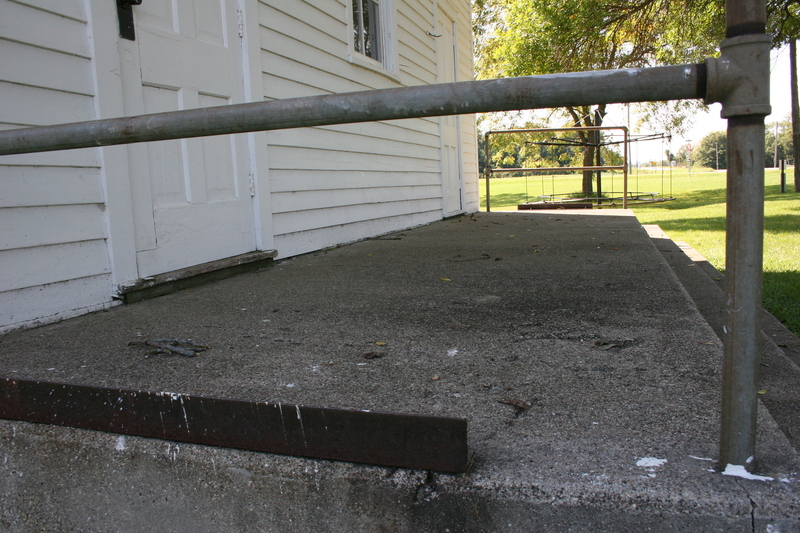 She and her family also attended Little Prarie Church across the street, not because they were particularly Methodist, but because it was the closest church to their farm by horse and buggy and Grandma liked he music there. Nice little trip down memory lane for me. Thanks!! Nan, I am glad I could take you down memory lane with these photos. Thank you for sharing your family’s connection to the school and church. I laughed at the “not being particularly Methodist” part of your comment. Your grandma sounds like a wonderful woman.